I met up with the boyfriend last Thursday morning so we could watch Iron Man 3. Since it was almost around lunchtime, we decided to eat first before watching the movie so we wouldn't be so hungry after. Looking for a place to eat always ends up with, "Ikaw na bahala. Kahit saan." He left the decision up to me so we went straight to Glorietta 4's Food Choices and scouted for something to eat. I suddenly remembered Go Greek! because I desperately wanted kebab. I didn't want to go to a fine dining/high end resto since I know it would take longer to eat. Food courts generally offer you the same thing (something fried, something grilled, something sizzling) but Food Choices actually has the widest variety of food stalls I've seen. Located at the extreme right of Food Choices, this Greek budget friendly food joint is the brainchild of Chef Rob Goco (Cyma, Charlie's Grind and Grill) and offers mousakka, kebab, gyro, and lemon chicken. 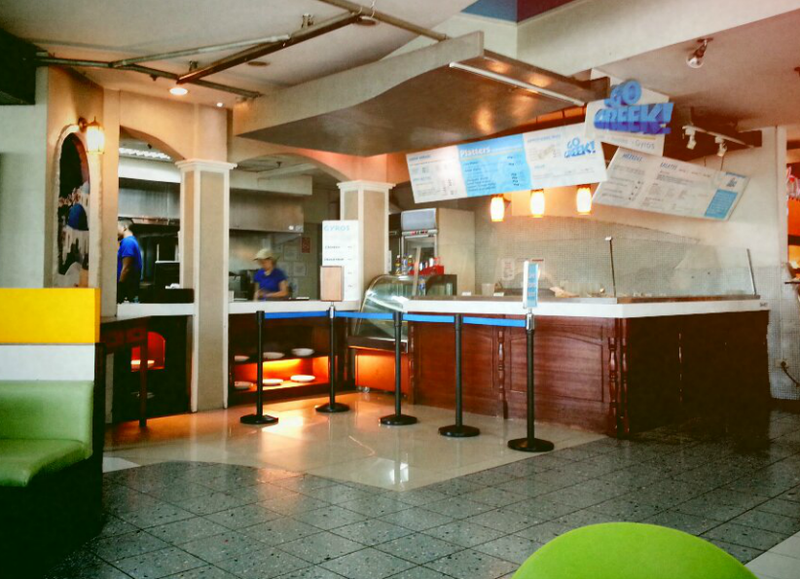 I liked how their palette of colors where white and blue as it projects a clean ambiance in the midst of the busy food court. It definitely stood out among all the food chains there. I admit that I'm not very familiar with Greek cuisine so I was a bit confused on all the things at their menu (haha) and how to place an order. Thankfully, they made it easy for us newbies to order as they have platter offerings. By the way, for the platter meals, you will be asked if you want it to be served with potatoes or with rice. 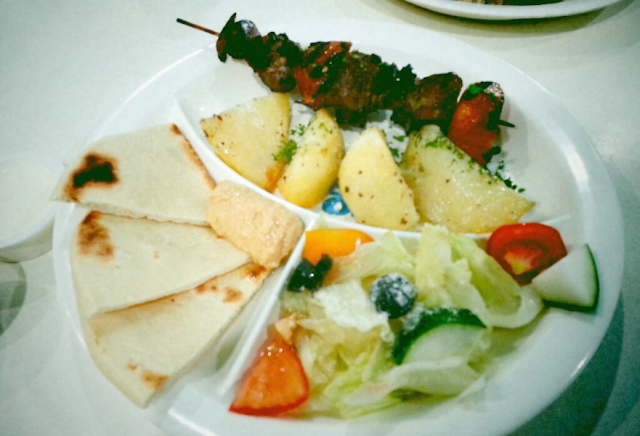 For our brunch that day, I ordered their Lamb Kebab Platter (PhP 155). Sorry for the poor quality of the photo. I assure you that the lamb kebab doesn't look that burnt. Hehe. The platter consists of the wonderfully grilled lamb kebab (4 chunks of lamb, I think, skewered in between quartered red onions and whole tomatoes), garlic/sour cream flavored potatoes, 3 pieces of pita bread with hummus dip and fresh greens on the side. My favorite would have to be the potatoes because the flavors were just excellent and it was cooked perfectly. 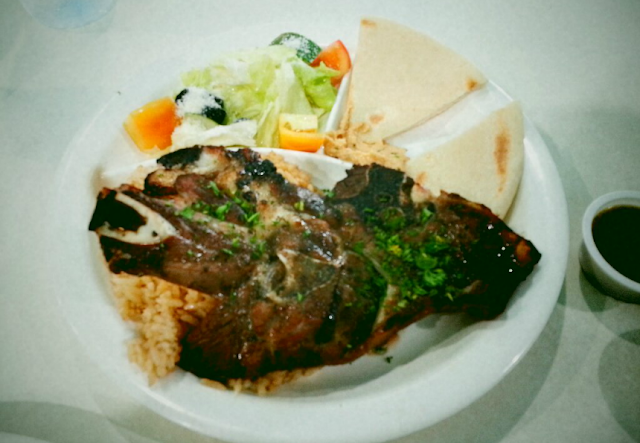 The lamb kebab was actually very tender and moist and for me, it went well with the pita bread. The pita bread was just soft and a delight to the taste buds when dipped in the hummus. I've never tried hummus before so this was a first! The boyfriend ordered this one. The main difference from what we both had was he wanted rice to go with it and that ginormous roasted lamb. Sadly, the lamb was a bit chewy. I know he really wanted to finish the entire thing but the meat was too rubbery to cut! He said the lamb tasted really good but it was just not as tender as we hoped it to be. *Insert sad face here* He found the salad to be a sort of saving grace because it tasted fresh, the vegetables are crunchy and the vinaigrette added a great flavor to it. Overall, eating at Go Greek! was still great. Hopefully, they could improve the lamb chops. I would still definitely recommend this place to everyone who's tired of eating the same old boring food. Delicious, flavorful Greek food on a budget! Of course, they don't have an extensive Greek menu but they pretty much covered the basics.